The Hollywood Reporter called him “A Standout”, and Entertainment Weekly described it as “charismatic crankiness”. 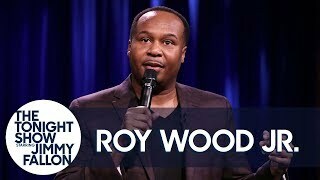 The thought-provoking comedy of Roy Wood Jr. crosses cultural lines and has entertained millions nationwide by stage, radio and television. Wood currently appears in the TBS’ hit comedy, Sullivan and Son, guest-starring as the likable sidekick and best friend of bar owner Steve Byrne, who returns to Pittsburgh to run his parent’s local pub. Wood, a native of Birmingham, Alabama, began his comedy career in 1999 at the age of 19 while attending Florida A&M University. In 2002, Wood earned a slot as one of 10 national finalists in Comedy Central’s Laugh Riots competition in Los Angeles. In March 2003, Roy was selected for Star Search on CBS where he advanced to the semi-finals. He also appeared on It’s Showtime at the Apollo, Live in Hollywood and the 2005 season of Comedy Central’s Premium Blend and BET’s Comic View. Wood appeared at the 2006 Montreal Just for Laughs Comedy Festival in the “New Faces Showcase” where critics awarded him top honors. The Montreal Gazette said, “Roy Wood Jr. gives tremendous show” taking “the top spot”. In 2006, Wood appeared on the Bob and Tom Radio Show: The Comedy Tour a one-hour special, which aired on Comedy Central. In 2007 Roy performed on The Late, Late Show with Craig Ferguson and BBC America’s The World Stands Up in London. In October 2006 Wood made his network television debut on Late Night with David Letterman. In 2008, Wood appeared on HBO’s historic Def Comedy Jam. In 2010, he was selected by America as one of the top three finalists on Last Comic Standing and followed that up with the first of numerous appearances on CONAN. Wood has recorded three nationally-released prank call CD’s: My Momma Made Me Wear This (2003), Confessions of a High School Bench Warmer (2005) and I’ll Slap You to Sleep! (2009). And has recently released his first comedy CD Things I think, I think (2013).